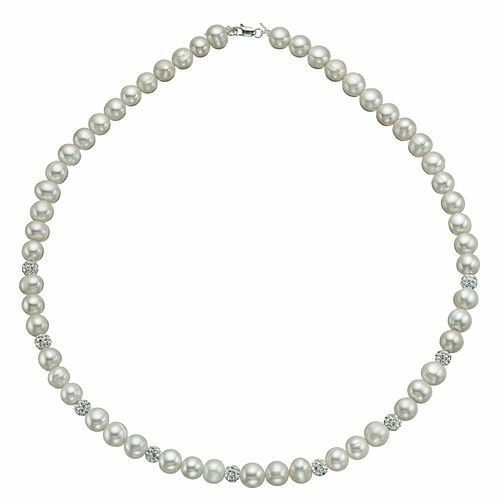 A classically elegant cultured freshwater pearl necklace set with glittering crystals for a glamorous finishing touch. Perfect for that special occasion. Sterling Silver Crystal Cultured Freshwater Pearl Necklace is rated 4.3 out of 5 by 6. Rated 4 out of 5 by Anonymous from Good item with one fault The clasp is so small and so smooth it takes a while to fasten the necklace. This is a shame as it looks great but it’s so fiddly it’s actually impossible to fasten by yourself. So disappointing is the verdict.